An essential aspect of good telescope design is to minimize any stray light in the light path and in the focal plane. A closed tube and carefully constructed baffles are crucial. However, to absorb the last stray of photons, all interior sides and edges should be thoroughly blackened. Standard matt black paint is hardly suited to this task: At shallow angles of light incidence, as they are typical of the telescope tube, a standard "matt" finish is in fact still far too glossy. Instead, deep-black chalkboard paint can be used to blacken the interior of your telescope tube, the interior of parts or accessories and the sides of prisms and lenses effectively. This chalkboard paint is of durable quality with good adhesion characteristics, which means that the color coating does not peel off easily. And it's an inexpensive buy, too: You can blacken large areas without huge costs. 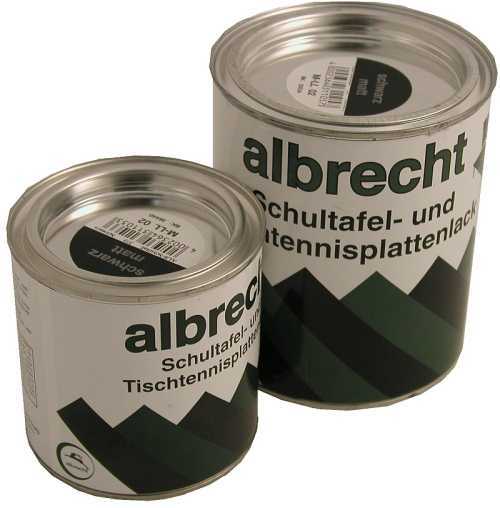 This does not mean that chalkboard color is a solution only for amateurs: Reputable companies in the optical industry use chalkboard paint in their production process. A surface coated that way will absorb stray light better than any velour, Decefix or other "recommended" materials. Please note: Anodized aluminum surfaces are non-reflecting in the visible spectrum but in the infrared, they have a reflection coefficient of almost 90%. In CCD applications this can be very annoying, since most CCD sensors are quite sensitive in the IR region. The chalkboard paint can be applied easily by brush or roller. The paint is dry in 10–30min and dust-dry and after 15hrs. (Note: Long tubes usually take more time to dry. You can speed up the drying process by making sure that there is adequate air circulation in the tube.) Chalkboard paint dries quickly in the oven at 100°C.